But it was Uruguay, not Brazil, who had been world champions before – winning in 1930. 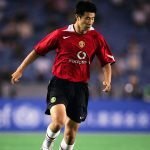 Having failed to make the subsequent two tournaments in Europe, they were undefeated in World Cups and to their minds were defending their trophy in 1950. It was they who would prevail once more, leaving Brazil to their grief and soul-searching. 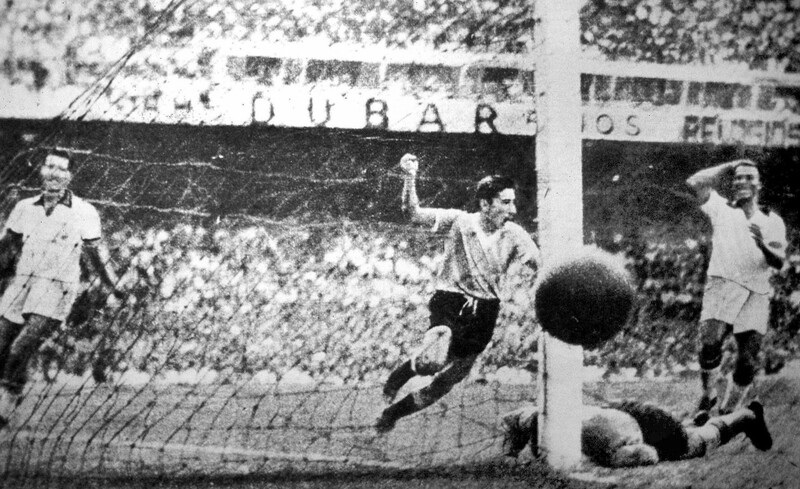 The central character of the event that became known as the ‘Maracanazo’ was Alcides Ghiggia. The 23-year-old was a gifted right-winger who played at arguably Uruguay’s greatest club, Peñarol. He had enjoyed a magnificent tournament, scoring in all three of Uruguay’s games thus far. But in the final, after a goalless first half in which Brazil had created countless chances to score, it was the home team that finally took the lead a minute into the second half through their forward Friaça. As Brazil continued to attack, confidence abounding and the World Cup now well within reach, they left themselves vulnerable. Midway through the half, Uruguay captain Obdulio Varela played the ball to Ghiggia on the right where Brazil’s left-back Bigode had given him too much space. Ghiggia danced past him and crossed for the Uruguay superstar Juan Schiaffino, who headed home the equaliser. Brazil were still in pole position, though; a draw was sufficient to win them the trophy, and they kept on playing in their open and attacking way. The warning was not heeded. The Brazilian goalkeeper Moacyr Barbosa never got over it. Barracked and outcast as “The man who lost us the World Cup” he only played for his country once more. Much later in life, he was barred from visiting the Brazilian team at the 1994 World Cup for fear of bringing them bad luck. Barbosa told reporters: “In Brazil, the maximum penalty for a crime is 30 years; I’ve spent 44 years paying for a crime I didn’t even commit.” Another casualty of 1950 was Brazil’s all-white kit, now considered jinxed. Thanks to Ghiggia’s goal a new kit design was sought and the iconic, and now synonymous, yellow and blue was adopted. The treatment of Barbosa is in stark contrast with the way Ghiggia was later treated in Brazil. “Sometimes I feel like I am Brazil’s ghost. I’m always there in their memories,” he said. “They are always very affectionate towards me. Despite all that happened, people in Brazil still recognise me, they still come to talk to me about it. World Cup-winning hero that he was, Ghiggia only played 12 times for Uruguay and scored just four goals. All of them came in that glorious and dramatic 1950 World Cup, where he became the first player to score in every match of the finals. His short international career was partly due to having become one of South America’s earliest football exports when left Uruguay and Peñarol to spend nigh on a decade in Italy playing for Roma and Milan. Travel being what it was in those days, his international career for Uruguay came to an end with that move, though he did play later for Italy a handful of times having become a naturalised citizen in 1957. He even tried his hand at the World Cup again in the Azzurri blue rather than the Uruguayan celeste. He played in the qualifying rounds of the 1958 tournament, scoring once in his five appearances. But his World Cup Midas touch had gone – that would be the only time Italy have failed to qualify for a World Cup. “It was difficult, but I was also very proud,” he recalled. “Of course my Italian inheritance qualified me, but it was something special for them to select someone who had been born and brought up in another country.” And been the World Cup winning hero for another country no less. Having returned home to Montevideo in 1963, he played for Danubio until retiring at the ripe old age of 42 in 1968. Like the other members of the 1950 World Cup winning team, on retirement Ghiggia was given a job by the government. He worked at the Casino Montevideo keeping an eye on potentially cheating gamblers. His state pension when he retired from the casino saw him have to resort to selling his World Cup medal to help make ends meet. Heart-warmingly, it was bought by a Brazilian-Uruguayan businessman who, having paid a princely sum, returned the medal to Ghiggia. He also worked occasionally as a driving instructor, his first student later becoming his third wife. He may not have become wealthy as a result of his exploits, but he was always remembered fondly. To commemorate his 80th birthday a special postage stamp was commissioned with his picture and the message: ‘Ghiggia nos hizo llorar’ – Ghiggia moved us to tears. Even in the country that he moved to tears of trauma, he was similarly remembered and revered. Alongside a mould of Pelé’s feet at the Maracanã walk of fame is a mould of Ghiggia’s.